Data initiatives as Global Fishing Watch and Sea Around Us aim to contribute to sustainable fisheries by providing transparent information. To achieve this virtuous ambition, these projects use data of Marine Regions! Global Fishing Watch is an indepent, international non-profit organisation, promoting ocean sustainability through greater transparency. They use cutting-edge technology to visualise, track and share data about global fishing activity in near real-time and for free. The Sea Around Us is a research initiative at the University of British Columbia. The project assesses the impact of fisheries on the marine ecosystems of the world and offers mitigating solutions to a range of stakeholders. Tackling the global issue of overfishing starts with transparent fisheries data, forming the basis of informed, sustainable management. Two particular initiatives pursue this goal by gathering and providing those data. 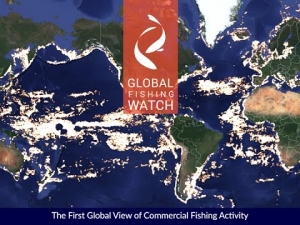 Global Fishing Watch offers data and near real-time tracking of global commercial fishing activity, aiming to track all large-scale fishing within the next 10 years. Sea Around Us presents fisheries and fisheries-related data at spatial scales that have ecological and policy relevance, such as by Exclusive Economic Zones, High Seas, or Large Marine Ecosystems. 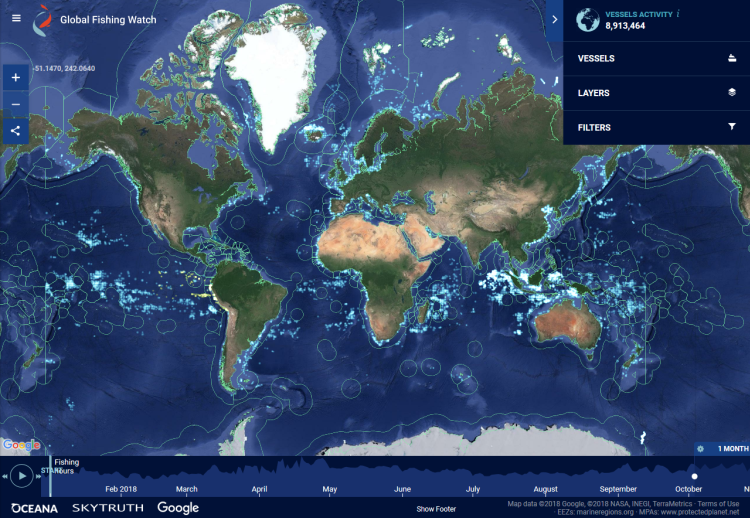 The Global Fishing Watch map gives the public a way to see the tracks of commercial fishing vessels at sea in near real-time. Using this freely accessible map, anyone is able to analyze historical data, dating back to 2012, upload their own datasets to deepen and broaden their own analyses and save and share their work. There are several activity layers available in the map: Fishing effort, Indonesian VMS activity, Peruvian VMS activity, Vessel encounters, and Night light vessel detections. The Sea Around Us provides interactive graphs for catches, data access and related information, and interactive catch maps. Catch time series from 1950 are available, as well as fisheries-related information on every maritime country. In addition, the project documents the historic expansion of fisheries, the performance of Regional Fisheries Management Organizations and the likely impact of climate change on fisheries. 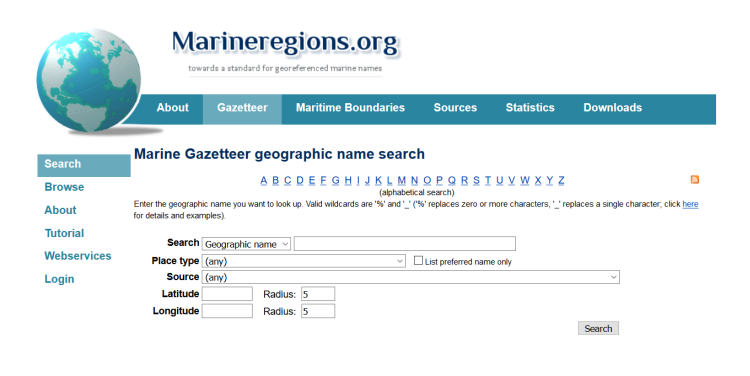 The Exclusive Economic Zone boundaries in the databases of the Global Fishing Watch and Sea Around Us were adapted from the data available from marineregions.org. Having these EEZ spatial units available allows these projects to group and analyse the data, and calculate fisheries indicators per country, leading to more transparency.